Arizona’s Senator Barry Goldwater asked to look inside it. Presidents, tourists, and ufologists have tried to see what’s there. How many aliens that crashed at Roswell, it is asked as if the question is full of facts, are stored at a special storage facility at Wright-Patterson Air Force Base in Dayton, Ohio? But the myths and reality of Hanger 18 are hard to pin down, and live on today. According to reports, a flying saucer crashed during a violent thunderstorm in a remote area of New Mexico, just northeast of Corona, west of Roswell, on or around July 2, 1947. Military personnel from Roswell Army Air Force Base in Roswell, New Mexico quickly cleaned up the crash site. Roswell has always been a super secret location, because that’s where the bomb squads with Atom bombs were stationed. In addition to the crashed saucer, reports, unconfirmed eyewitness accounts, said that four-grayed skinned alien bodies, dead spacemen, no more than three or foot feet tall, were also recovered from the crash. Where would they take these items of interest to national security? The remains of this spacecraft and its occupants were placed, we are told, on huge transports and quickly flown to the infamous "Hangar 18" at Wright-Patterson Air Force Base in Dayton, Ohio. Did any of these events actually take place? Who knows now? But one thing is clear, Hanger 18 and Wright-Patterson have been the focus as the location they would have been stored. In the 1960s-1970s, one of the most prominent ufologists in Ohio was Leonard H. Stringfield. As opposed to all the skepticism, ridicule and jokes that came from within the ranks of ufology about the reports of Hanger 18, Stringfield decided to conduct a series of serious investigations and interviews. 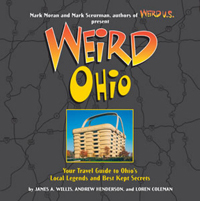 As ufology historian Jerome Clark points out in his books, Stringfield then began publishing a series of monographs with credible firsthand accounts of people saying they had seen the bodies at Wright-Patterson. As Clark writes in Encyclopedia of Strange and Unexplained Physical Phenomena (1993), what was striking about Stringfield’s informants’ descriptions of a pear-shaped headed, slant-eyed gray, four-feet tall aliens in his 1979 works is “its anticipation of the type of being that would figure in the UFO-abduction lore of the 1980s and beyond. Humanoids of this sort are rare in the early UFO literature of occupant reports.” Jerome Clark’s work confirmed that others had heard or seen some very strange things, some even said to be aliens in storage at Wright-Patterson. But skeptics are hard on the story of Roswell and the grays at Hanger 18. 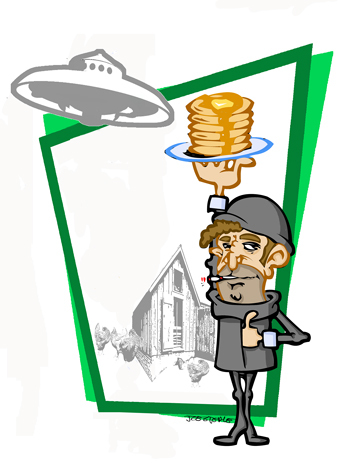 What we do know is that Dayton, Ohio’s Wright-Patterson Air Force base may not house aliens, but for certain it does contain wonderful archives and alleged outer space pancakes. The point, of course, is not the Nebraska story, but that evidence of this event is in Dayton. And there is one other semi-humorous example that has been enjoyed in the annals of ufology. On April 18, 1961, Joe Simonton was having a late breakfast at 11 AM when some low, jet-like noises disturbed him and he went outside. Seeing a disc land, hatch open and a non-threatening being get out, Joe saw the visitors didn't speak English, and all communication took place in the form of gestures. But also, according to Joe, he apparently telepathically picked up a message to get some water in a jug for the entity. Then, according to the Air Force report: "Looking into the [saucer] he saw a man 'cooking' on some kind of flameless cooking appliance." They were fixing what Joe took to be pancakes. Three humanoids in a silver craft landed in Eagle River, Wisconsin. Apparently in trade for the water, they gave Joe Simonton four pancakes. Each one was about three inches in diameter, and had little holes throughout their surface. Simonton ate one. “It tasted like cardboard,” Joe told the Associated Press. Jerome Clark in his High Strangeness: UFOs from 1960 through 1979: The UFO Encyclopedia, Volume 3 (1996) gives a more detailed rundown of the Joe Simonton case under "Eagle River CE3" on pages 168-175. Clark's comprehensive report on the case does not talk about anything but how the objects were seen as “pancakes.” The FDA who also analyzed one of the objects called them all “pancakes.” Clark also does note the “pancakes” were “still hot” when Simonton took a bite into one of them.